The 6-story building between Fifth Street and Sixth Street has returned to the sales market. The 10,948 square foot building (approx.) contains 10 residential units and one retail unit. Currently, of the 10 apartments, eight are free market and two are rent stabilized. 69% of the property’s income is derived from the residential component and 31 percent from the ground floor retail. The 10 residential apartments comprise 9,123 SF of the building’s gross square footage and are made up of two, three, and four bedroom units. The retail tenant on the ground floor is a restaurant currently paying $249,142 annually. This building is notable for being the source of a legal tussle between Raphael "I will bury you" Toledano and developer Michael Shah. During a hearing in November 2017, a federal judge tossed a bankruptcy case filed by Toledano, ending his bid to stop the sale of 97 Second Ave. to Shah’s Delshah Capital, The Real Deal reported at the time. Both landlords were claiming ownership of the building. It's a little complicated. Read the Real Deal piece here for the full blow by blow. However, it was never buried, and now awaits another owner. Toledano reportedly lost control of the property when he defaulted on a $2-million loan. No. 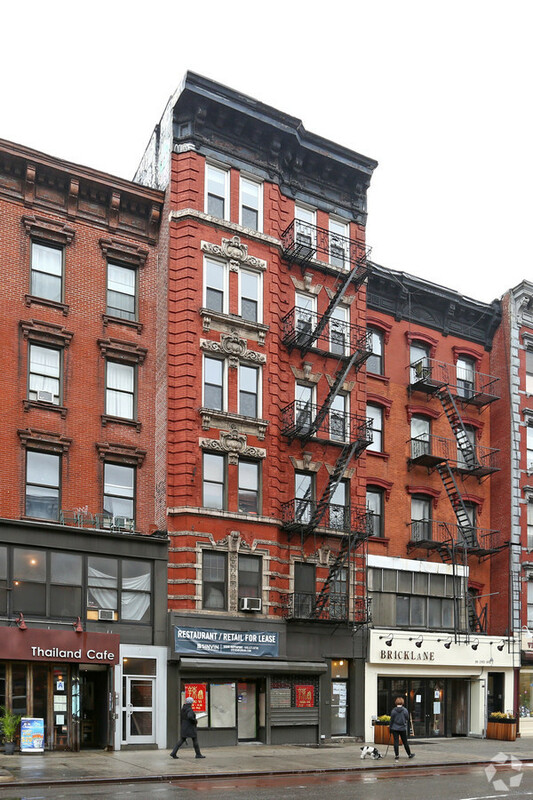 97 was one of the first East Village properties purchased by Toledano. Public records show that Toledano paid $4.95 million for it in April 2014. Beautiful facade. Was even better looking when the launderette occupied the storefront. But Toleando ruined any good vibes here. Better have a good retail tenant, or else your investment is toast. Love the old school tenement floorplans with tiny rooms. Seems overpriced but doesn't everything seem overpriced. I wish the rent-stabilized tenants well on the ownership transfer. I miss the days when people, rather than LLCS, owned buildings, kept them for years if not decades, and knew their tenants and their families by name, when owning real estate was a responsibility to be taken seriously, not a shell game between con artists. "The retail tenant on the ground floor is a restaurant currently paying $249,142 annually." So says the broker-babble; yet the photo indicates that there is NO retail tenant on the ground floor - in fact, they seem to be looking for someone to rent the place.